Nearly 2 million people in the UK are thought to suffer from poor vision. Currently, the only feasible solutions are to wear prescription glasses, contact lenses, or to undergo invasive laser eye surgery. With the invention of the Eye Card, vision may be improved without the hindrance of glasses or the medical risks of surgery. Eye Cards are the size of a credit card and neatly fit over the nose bridge to provide a magnified view when reading, writing, or carrying out near-vision activities. The unique design clips over the nose, eliminating the need for burdensome arms. Whilst Eye Cards can be tailored to suit a reading glasses prescription, they remain discreet and subtle due to the absence of rims, frames and arms. 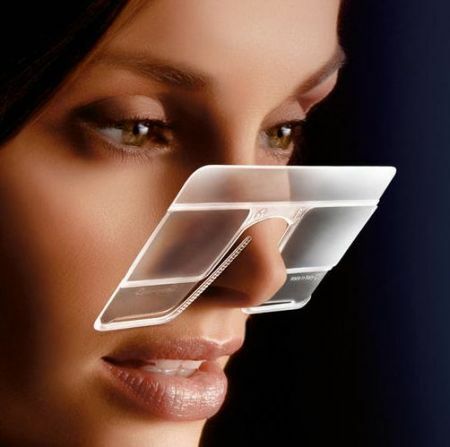 Their innovative design provides the ideal solution for people requiring magnified vision in an instant, for example when reading a map, cinema ticket, or text message. The lenses are made of durable polycarbonate with a scratch-resistant coating, meaning they can be safely stored in your wallet without being damaged. Measuring just 85 x 50 x 2mm, Eye Cards can be easily stored, without the need for a large glasses case. They are also fully adjustable, providing a comfortable fit for all wearers. But will this technology catch on? Or will it simply be a passing craze? The impracticalities of Eye Cards are important to consider. They may be small and compact, but when worn, the Eye Cards extend from above the eyebrows to halfway down the cheeks. This is due to the fact that the Eye Cards need to remain stable to prevent them slipping down the nose. Whilst glasses may be more aesthetically imposing, the arms which extend around the ears provide essential support and stability. And although Eye Cards are marketed as ‘hands-free’ eyewear, it could be argued that contact lenses are the ultimate hands-free solution, as they provide invisible, visual clarity all day long. In addition, due to the thin lens quality and unimposing shape, the Eye Card is only suitable for a reading glasses prescription. Those requiring a stronger prescription would need to choose a pair of suitable glasses frames to cater for the thicker lenses. Nevertheless, for an instant fix for reading something on the go, Eye Cards could be an ideal alternative to glasses. So, if you’re looking for a solution to your eyewear problems and are reluctant to experiment with contact lenses, the Eye Card could be worth a try.